ActionAid has been awarded €125,000 by the Irish government for its relief effort in Haiti, following Hurricane Matthew. In total, 2,128,700 people, 12% of Haiti’s population, have been affected by the hurricane, including 894,100 children. The funding will be used to provide emergency sanitation and training for the prevention of cholera; equipment and training for the reconstruction of buildings and direct support for rebuilding livelihoods, particularly for women. Yolette Etienne, CEO of ActionAid Haiti, says: “ActionAid is deeply concerned about the risk of cholera, with several deaths reported already. It is a race against time to supply communities with food, water and potentially life-saving hygiene kits to guard against the spread of disease. We are particularly concerned for women and girls, who are especially vulnerable in the wake of a disaster like Hurricane Matthew.” Yolette is Haitian and has been CEO of ActionAid Haiti for almost three years. Listen in to Yolette Etienne speaking on Morning Ireland. ActionAid has been working in Haiti since 1996, working with communities and local partners to run emergency and long-term programmes, making the organisation uniquely placed to respond. 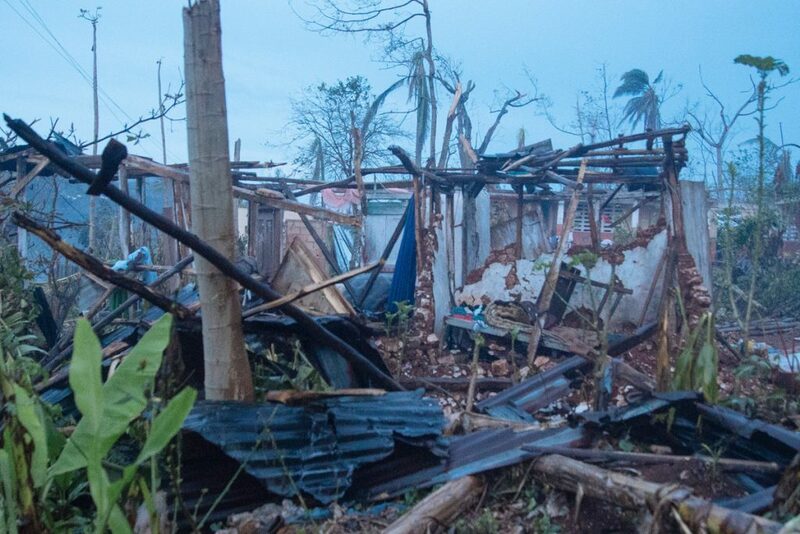 ActionAid, its partners, and volunteer community groups founded by the charity were among the first responders after the Hurricane hit on 4th October. Local partner, KPGA (Konbit Peyizan Grandans/Farmer’s Movement of Grand Anse) is a partner of ActionAid Haiti since 2007, working primarily on women’s rights, food security, sustainable agriculture, education, environment and good governance. Following the World Humanitarian Summit, ActionAid Haiti trained 30 women in leadership in emergency preparedness and response. Four of the women are in Grande Anse, and will be actively engaged in the programme; in needs’ assessment and in the definition and implementation of adequate response measures with the support of trained women from other departments. KPGA has significant emergency response experience, having responded to the earthquake in 2010 and subsequent hurricanes. Context Analysis: Hurricane Matthew struck the south west of Haiti on 4th October, 2016; with the majority of the damage occurring in the southern departments, with Grand Anse particularly affected. The hurricane has caused widespread flooding, damage to roads, bridges, schools and hospitals including outage of telephone communications. In total, 2,128,700 people, 12% of Haiti’s population, have been affected, including 894,100 children. According to the latest government figures, 1,410,900 people, including 592,600 children, are in need of humanitarian aid, of which 750,000, including 315,000 children, are severely in need. At least 175,500 have been evacuated or displaced and housed in 224 temporary shelters. So far, at least 1,000 people have been reported dead but the death toll is still expecting to rise as access to worst-affected areas is improving (Sources: OCHA 12/10/2016 and Al Jazeera 10/10/2016). ActionAid Haiti (AAH), with KPGA and community women leaders carried out an initial rapid assessment reporting drastic levels of damage to houses, infrastructure, schools, fishing villages, and the loss of personal belongings and livestock. In Jeremie alone 95% of houses were completely or partially destroyed. Communities have reported a near complete loss of crops. Houses and schools that are less damaged are being used as shelters, some houses having to host 3 or 4 families, and schools unable to re-open due to being used as shelters. Some previously identified shelters were damaged as people were trying to access them, creating a lot of trauma among the populations. The situation is exacerbated as the available contingency food stocks, drinking water and latrines in many shelters were insufficient even prior to the hurricane. Market prices for necessary items have spiked and communities report that markets are difficult to access. Water distribution systems have been destroyed in several areas making potable water scarce. The inadequate Water and Sanitation situation suggests there is a high risk of a cholera outbreak, as of 11 October, 189 suspected cases of cholera were reported since the hurricane in Grande Anse; at least a dozen of the new patients in Jérémie were children under 10 (Source: DPC 11/10/2016). Disasters have a disproportionate impact on women and girls due to structural discrimination and marginalisation. Also the aftermath of a disaster places women and girls at greater risks of all forms of gender based violence. An ActionAid Haiti rapid assessment shows that there is no privacy in the shelters for women and girls, with the potential for GBV to occur – there have already been reported cases. Target Group: Direct beneficiaries: 36,000. Communities as a whole have been dramatically affected and will benefit from the project activities. However, single-parent families will specifically be targeted and women and girls will benefit from specific activities. Approximately 65% of the target population are female. The localities have been chosen based on rapid needs assessments; local presence and knowledge of communities with the partner organisation; presence of other actors to avoid duplication and ensure synergies; ActionAid Haiti ability to effectively provide adequate assistance and their status as current ActionAid programmes. The emerging most vulnerable groups are female headed households, small holder farmers; women and children at risk of trafficking; elderly and those with limited mobility.